What a wonderful website! Now I’m all natsukashii! 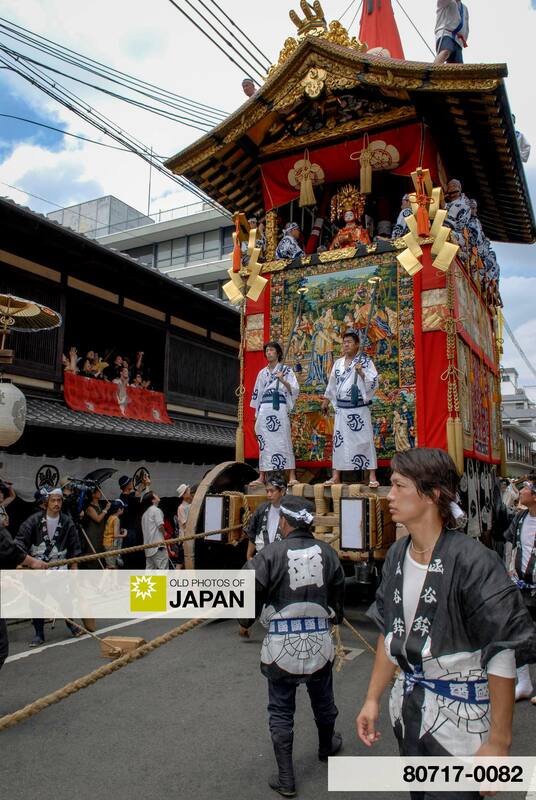 A festival float is being pulled down a street during Kyoto‘s famed Gion Matsuri, which takes place during July. The festival was started when in 869, Kyoto was suffering from pestilence. By order of Emperor Seiwa (850-880, 清和天皇), the people of Kyoto prayed to the god of Yasaka Shrine for deliverance of the disease. For each of the sixty-six provinces of Japan, a decorated halberd was displayed, together with mikoshi (palanquin to carry a god) from the shrine. In later years, if disease broke out again this ritual was repeated. It was made an annual event in 970. Over the years, the festival became increasingly elaborate and rich merchants started to use it to display their wealth. 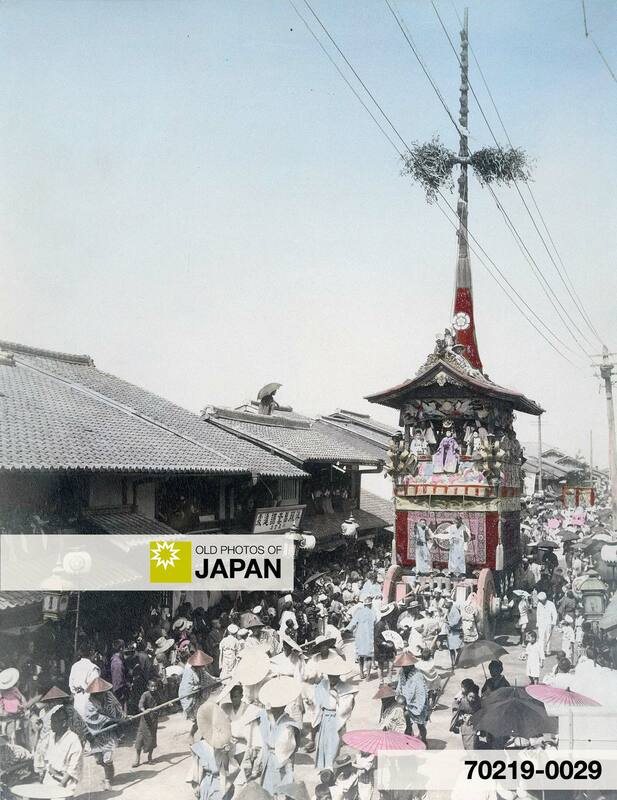 Today’s Gion Matsuri (click on the photo on the left) still looks very much like it did on this photo from the 1890s. Unfortunately, very few of the wooden buildings of those days remain. 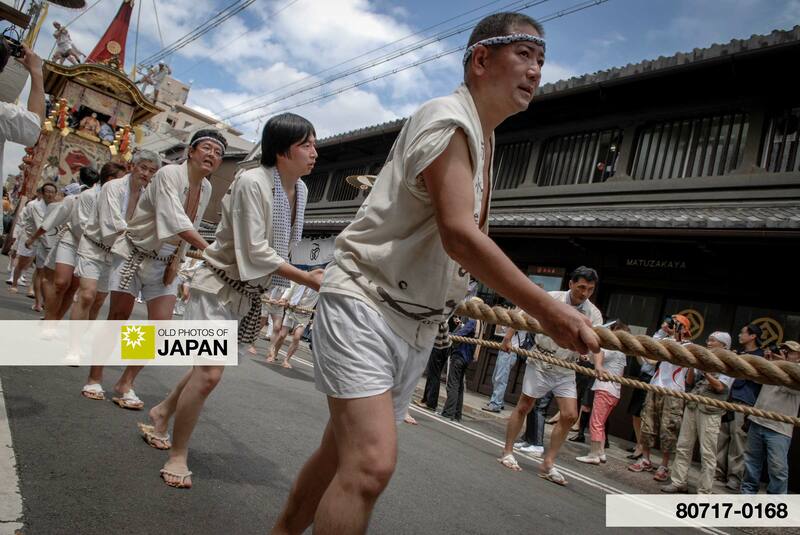 The highlight of the festival is the parade of the massive wooden floats, called yama (山) and hoko (鉾). There are 9 hoko, each weighing in at a respectable 12 tons. The 23 yama are smaller and weigh somewhere between 1 and 2 tons. All the floats are gorgeously decorated with tapestries, some of them made in Kyoto, others imported from abroad. As a large number of men pull the behemoths, musicians sit inside and play festival music. 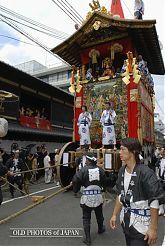 The float seen in the Meiji Era photo is called Tsuki Hoko (月鉾), it is one of the most luxurious ones of the festival. Tsuki Hoko celebrates Tsukuyomi no Mikoto (月夜見の尊), the Shinto god of the moon. According to Japanese mythology, the Japanese islands were created by the male god Izanagi and the female god Izanami. One day, Izanami dies in childbirth and Izanagi, overcome by sorrow goes to see her in the underworld. He is shocked by what he sees and flees away. After returning to the land of the living, Izanagi purifies himself with water. When Izanagi washes his left eye, the sun goddess Amaterasu Oomikami is born. When he washes his right eye, Tsukuyomi no Mikoto is born. When he finally washes his nose, the storm god Susanoo no Mikoto is born. The latter is the god that the people of Kyoto prayed to at Yasaka Shrine when Kyoto pestilence raged through the city in 869. On the site of British Paté is a silent newsreel showing the Gion Matsuri of 1928. There are already many modern buildings, but a little traditional architecture still remains. 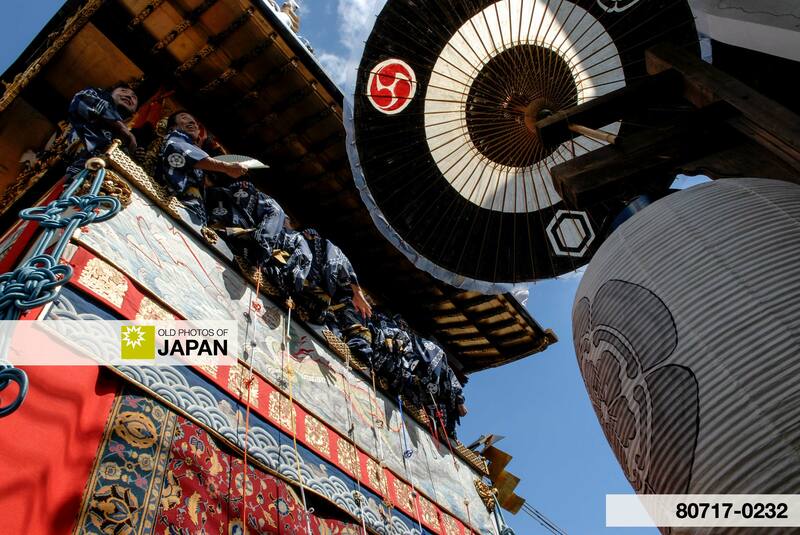 Long time Japan resident Ad Blankestijn has an excellent introduction to the Gion Matsuri on his blog. You can also licence this image online: 70219-0029 @ MeijiShowa.com.